That is really quite a list. Makes me feel like I'm not getting anything done. Warren, there's a place here in Michigan called MPR Race Cars. I don't know if you've heard of Mike Pulsteny (pull-stone-ee), but he has been building beautiful and very fast race cars for many years. He has the contract with Mopar to build the challenger drag pack cars. Wow, thats all? J/K, sounds like a ton of new stuff! Which fuel pump are you using? I couldnt imaine running the A1000 w/o an alternator? Fuel pump is a Bosch unit, draws 12 amp @ 5bar/16v. turns out going from 13.5 volts with alt., to 16 volts, the pump output capacity increases by about 30%. 16v output is dead linear even with batt. in voltage as low as 9.75V. The Jacobs Accuvolt 1500 will deliver up to 100 amps/1500 watts. I built the battery box to hold two AGM batteries just in case, but so far I'm surprised how long it will run and still start on a charge with just one . I always charged my battery between rounds anyway for consistancy. I think I would enjoy designing the hardware and layout for a project like that, but I wouldnt want to do the fabricating, getting to be to much work for this lazy man. I doubt I could teach them anything. Really?!?!? You guys are going to make me bring this up?!? OK, Warren, you are not fooling anybody. 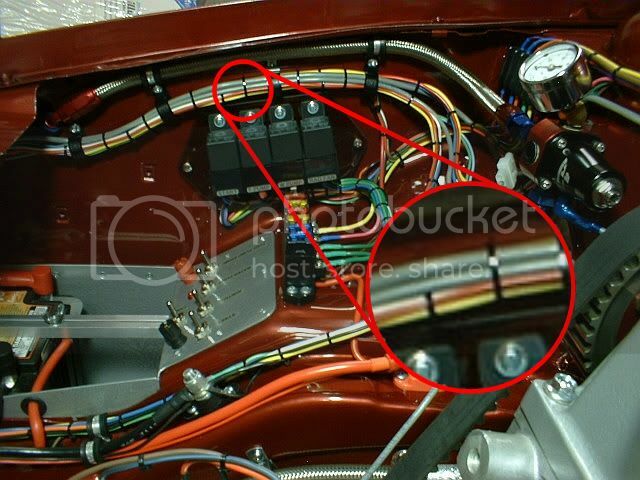 We can all clearly see that along the fender harness the white wire ducks behind the red wire when it should really follow its order the whole length. I mean c'mon, do it right or don't do it at all. I'm sorry I had to break it to you this way but your ego is obviously getting out of control. I can't say anything more than I absolutely love clean wiring since it is the area the average joe hacks to bits, yet when done properly it can look like structured art. Excellent effort and attention Warren. Once again I can only aspire. OOPS! I will have to fix that oversight, sorry bout that. seriously though, that is really freakin hard to bundle wire in parallel, the wire has a memory from being wound on spool. All kidding aside great job as always. cant say much thant the others , attention to details is ... freaking awesome ! Hey! I use the same oil filter as this awesome machine! Warren, I can honestly say that I've only seen MAYBE 3 or 4 vehicles in my LIFE that could compare to this! Your attention to detail and abilities are beyond belief!! if my car was 1/4 clean as your car id be happy. That Bosch pump has a really really low AMP pull. Is that why you picked it? plain old walbros pull near 20 at either 14 or 16 volts I can't remember, and have less capacity I am sure. I have 2 externals walbros and Megasquirt primes my fuel pumps for a full 5 seconds and on the worn out SLA battery I had I could hear the stupid pumps grinding down on the battery and changing tone. What is the Amp hours on those batteries? The entire current load with everything running is less than 40A. (actual measured) That includes Fuel pump. water pump,both control modules,instruments and even park and tail lamps. The battery voltage into the Accuvolt box can be as low as 9.75V and the output voltage will stay dead level 16v, or what ever I set it to as it is adjustable between 13-16.25v. The battery I'm using is a Odyssey PC625, 16 amp hr 12V. I gotta ask - what's an accuvolt box? I've been looking at these as well, to kill the alternator when racing.....they are $$$ though. I have an older version. Pretty cool but kinda leery that they'll drop my times by 1/2 sec? They are saying by simply adding that box I'll drop 1/2? If this was any other product saying that, it would be in the lounge and we'd be making fun of it. How do you get 1/2 out of .29 ? Is that metric time?